The male monopoly on Savile Row is over. 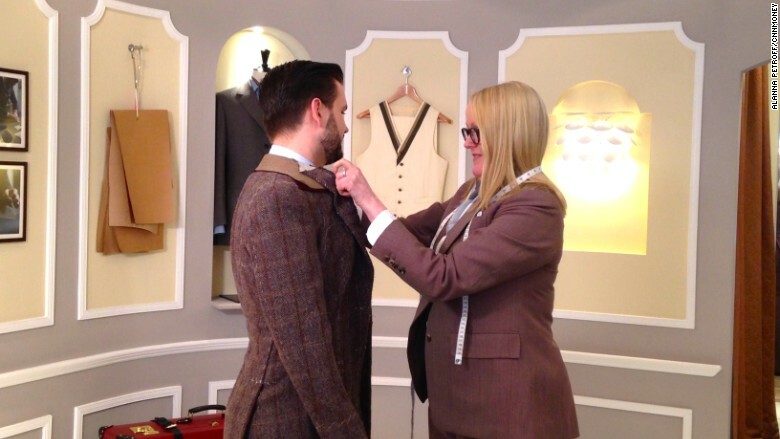 After 200 years, the iconic London street has its first female master tailor. Kathryn Sargent brought her eponymous brand to the street last week, offering custom-made suits for both men and women. Sargent began her career in 1996 as an apprentice at Gieves & Hawkes. She worked her way up for more than a decade, becoming the first woman "head cutter" on Savile Row. She then left to set up her own brand nearby. She says she's thrilled to be back on Savile Row, a place where she made outfits for royal families, celebrities -- including David Beckham -- heads of state and industry titans. "I just knew that this is where I wanted to work ... I'm continually inspired by what I see in the windows," she told CNNMoney. "[The new store has] been very well received [by] my colleagues and my contemporaries. They know me, I'm one of them," she said. Kathryn Sargent spent more than 10 years at Gieves & Hawkes before launching her own brand. Sargent said it can be intimidating -- and expensive -- to set up a tailoring business, but "you have to take a bit of a leap sometimes." She has invested heavily in the design of her new store, which showcases suits in various states of construction hung along the walls, and expects the new location will give her brand far more visibility. "I'm spending more than I really have to to make it beautiful and special, but it's worth it and the clients will appreciate it," she said. Prices for her bespoke suits start at £4,200 ($6,000). 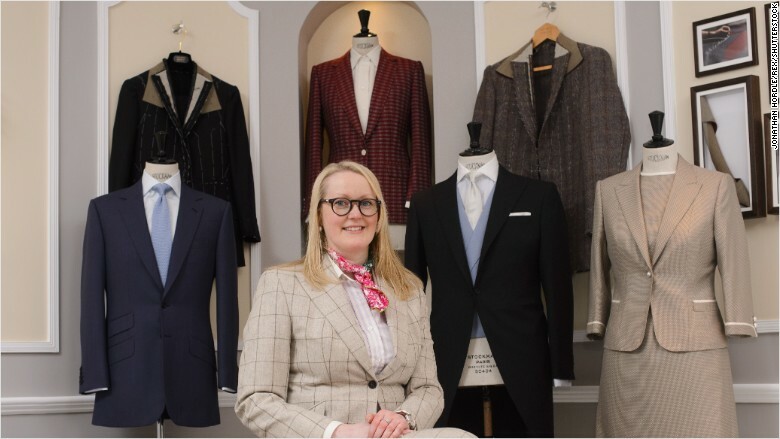 Savile Row tailoring continues to be dominated by men at the top, but more women are joining the ranks, and flourishing. Skinner said he's pleased to have another experienced tailor on the street. What matters most, he says, is protecting its reputation for world class tailoring. The craftsmen (and women) of Savile Row were famously upset when an Abercrombie & Fitch (ANF) store opened up on the street in 2007. The Savile Row Bespoke Association was established to help protect its heritage by encouraging tailors to work together and train apprentices. Kathryn Sargent opened her new store on Savile Row on April 6. As it stands, Sargent's new store is only slated to be open until the end of the summer, making it a kind of pop-up shop for the suited and booted. Sargent said she will consider longer term options in a few months, depending on how her business fares. In the meantime, she's focusing on the here and now. "It's a sign of the times that if you work hard, you can get to where you want to go," she said.